The island of Sri Lanka off the southeast tip of the Indian continent is truly blessed by nature and has a long tradition of respecting nature in return. Being the first kingdom in the world to embrace the Buddhist teachings of respect and compassion for all living things, it is not surprising that the world’s first wildlife sanctuary was established here in the 3rd century B.C. Sri Lanka boasts the world’s highest concentration of leopards and is one of the best places to have close encounters with blue whales, sperm whales and many species of porpoise and dolphins. More than 70 protected areas covering 14% of the islands land mass support biological diversity greater per surface area than any other country in the Asian region. Sri Lanka is a global bio-diversity hot spot with half of all species being endemic. The island contains an astonishing range of habitats: deep oceanic trenches, coral reefs, turtle nesting beaches, mangrove estuaries, lagoons, lowland rainforest and cloud forests. With over 220 stunning waterfalls, Sri Lanka has the largest number of falls for the size of its landmass of any country in the world. Students on this study adventure will learn about eight complex ecosystems through full immersion activities. They will study high elevation flora while climbing stunning peaks, learn about water hydrology while rafting a mountain river and study coral ecology snorkeling over tropical reefs. Camping overnight in the dry lowlands of a world famous national park will offer the best wildlife viewing outside the African continent with leopards, elephants, buffalo, deer, crocodiles, wild boar and birds in abundance. Students will go whale watching along oceanic trenches and release sea turtles from nesting beaches as Sri Lanka is revealed to them with one amazing discovery after another. There is more to this ancient land, of course, than nature at its best. Human habitation sites here date back over 35,000 years and the Sinhalese civilization that emerged after the advent of Buddhism has left a 2,000-year legacy of beautiful ancient cities and sacred sites. Then there is the 500-year legacy of Portuguese, Dutch and British colonialism students can experience at the UNESCO World Heritage Site of Galle Fort. Looking for a magical destination to get your kids out of the classroom and into the habit of lifelong, multifaceted learning? This is it! Students arrive at Colombo International Airport and after clearing Sri Lankan immigration and customs, we transfer 2.5-hours by charter mini vans to the ancient city of Kandy, the cultural center of Sri Lanka located in the center of the island. Nestled amidst verdant hills with a beautiful lake as its centerpiece, Kandy is the most picturesque city in Sri Lanka and the most important culturally. After checking in to a beautiful hotel overlooking the city, students will enjoy lunch and have an opportunity to view the famous Temple of the Tooth where a relic tooth of the Lord Buddha is enshrined. The Temple of the Sacred Tooth Relic in Kandy was built in the 18th century and declared a world heritage site by UNESCO in 1988. It is one of the most venerable places for the Buddhist community all around the world and is under tight security for in the past whoever possessed this venerated tooth ruled the Sri Lanka kingdom. Nearby the Temple of the Tooth, students can see ancient dances performed by a caste that once entertained Sri Lankan royalty. 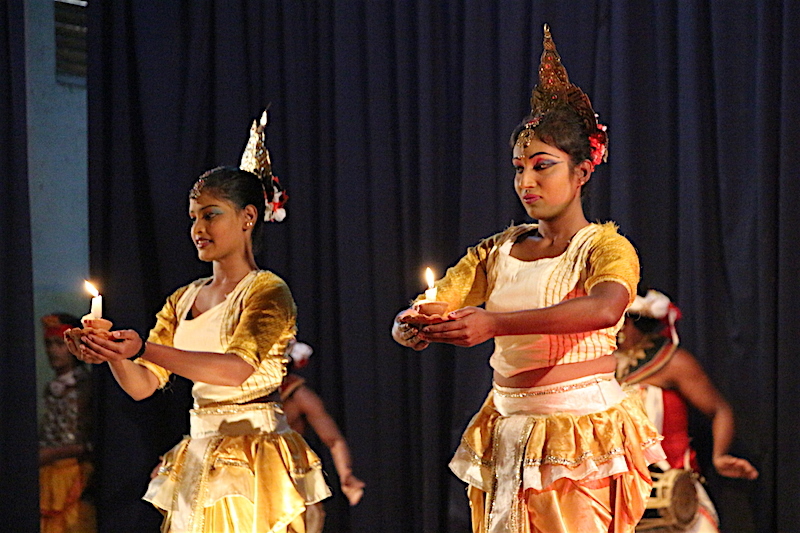 The history of the origin of the Kandyan dance is lost in time but local legends speak of a Kandyan king who had a recurring dream of a leopard directing its tongue towards him. It was interpreted as a curse of black magic and to combat it shamans from India were summoned to perform a ritualistic dance that took away the curse. Since then Kandyans adopted the dance form to be performed only by one particular caste. After a delicious buffet dinner at our hotel, we will have a short talk on the fascinating human history of Sri Lanka before getting some sleep for a full day of adventure ahead. Early risers may wish to join our staff on a morning stroll or jog around beautiful Kandy Lake. It looks like snow is falling when thousands of snowy white egrets set off from their overnight perches on their daily feeding forays. Back at our hotel we all enjoy a sumptuous buffet breakfast before checking out and driving 30-minutes to Gampola where students can learn about Sri Lanka’s most celebrated industry – Ceylon tea production. In the 1800s, coffee plantations were the islands main profit earning industry but during the 1870s, a fungal disease gripped the coffee plantations all over the island and wiped out the entire industry. Tea trees proved more resilient and better suited to the climate of the hill country. Sri Lanka is now the world’s fourth largest producer of tea and the tea industry is one of the main sources of foreign exchange. Students will learn about Ceylon tea production by first practicing leaf selection with Tamil women instructors. Picking off two leaves & a bud from trees over a century old, students can then witness the step by-step process of fermenting, drying, cutting and grading in the tea factory. This will be followed by a tea testing session where everyone can experience the wonder of different flavors. We now have a 1.5-hour drive to the Kalaniya, the nations third largest river, for a scenic and exciting rafting trip. 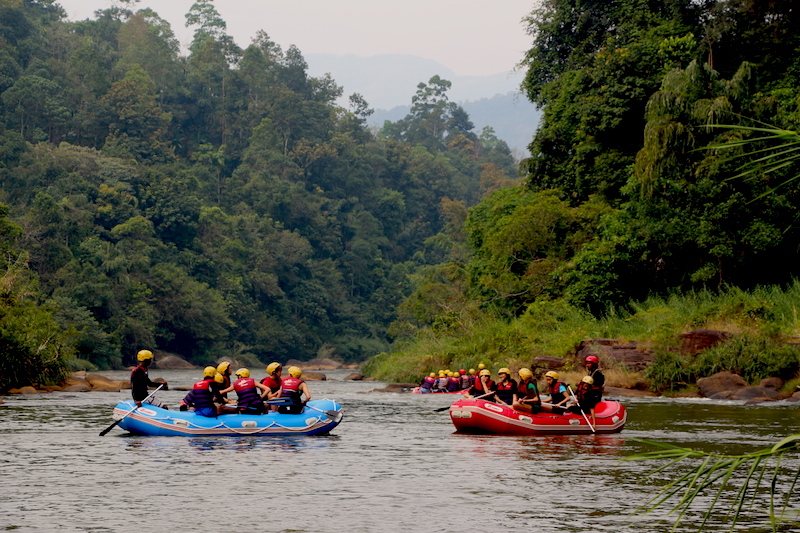 After a thorough safety briefing, students will set off on a 2-hour rafting adventure that offers lessons in riparian zone ecology and river hydrology. 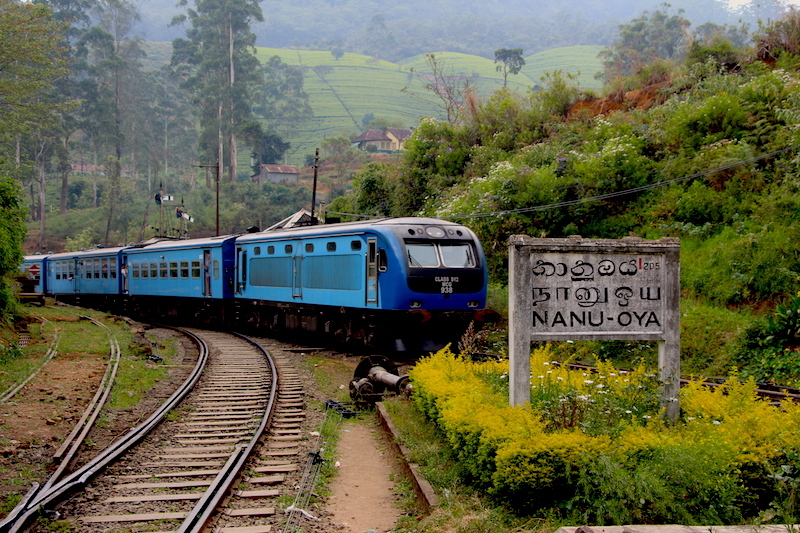 Around noon we end our raft trip at Ginigathana village, pick up picnic lunches and hop aboard the 1:30 pm historic train to Ella for a 3.5-hour rail journey through one of the most beautiful landscapes on earth. 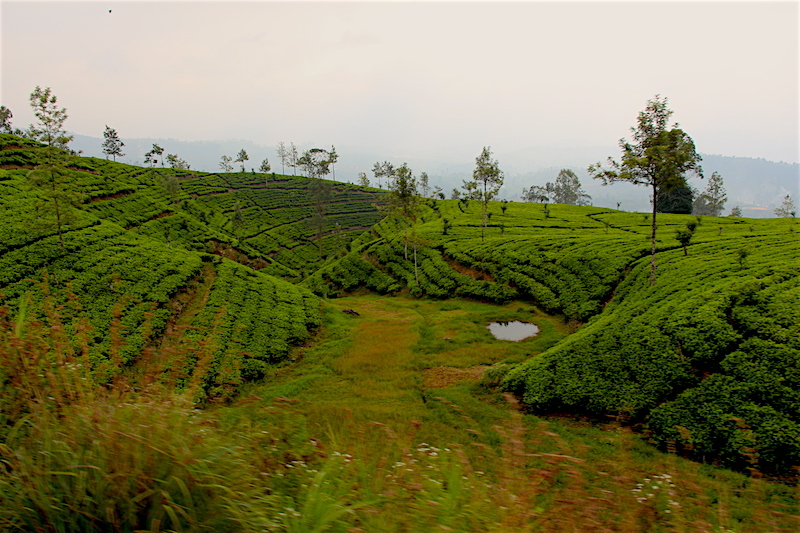 Climbing up through lush tea estates, the train enters high mountain forests of tree ferns and pines before crossing a summit pass and descending through terraced farmlands, enchanted forests and mountain valley hamlets. Disembarking at Ella’s quaint railway station at 5:00 pm, we transfer a short distance to our mountain retreat for the night. After enjoying a delicious dinner in the open-air restaurant of our lodge, we will gather together for a candle-sharing circle under a sky with stars so close you feel you can reach out and touch them. 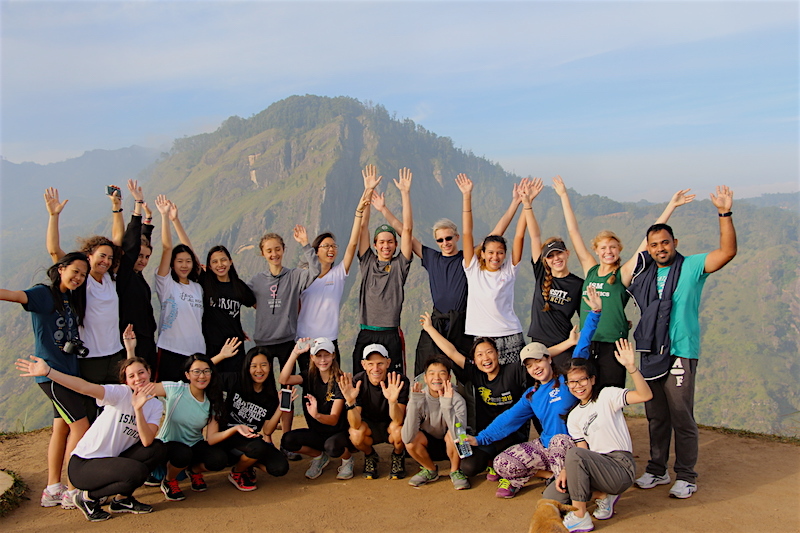 No one will want to miss the glory of sunrise this morning, so we rise early, eat a light breakfast and set off to climb Little Adams Peak along a trail that begins right at our lodge. Framed by towering Ella Rock and the spectacle of the wondrous Ella Gap, the view from Adams Peak (1,141meters) is said to surpass all other places in Sri Lanka for spectacular scenic splendor. After a 2-hour trek, we return to our lodge for a full breakfast and then begin the descent drive to the Sri Lanka lowlands. The change in vegetation zones as we drop from over 1000 meters to sea level is dramatic. Shortly after reaching the lowlands we will make a visit to Buduruwagala – a sacred site of the 9th or10th century that is thought to have been a hermitage for monks. Here a massive rock face depicts 7 sculptures including the largest standing Bhudda sculpture in Sri Lanka at 16 m. from head to toe. In this peaceful, secluded setting that receives very few visitors, students will take time for some quiet reflection and learn about the history of Buddhism. Though the Lord Buddha was born in Nepal and spent his entire adult life in India, Buddhism never took hold in those countries. Were it not for a Buddhist monk coming to the island in 247 B.C. and influencing the king to declare it the new spiritual practice of all Sri Lanka, Buddhism might well have failed to spread. 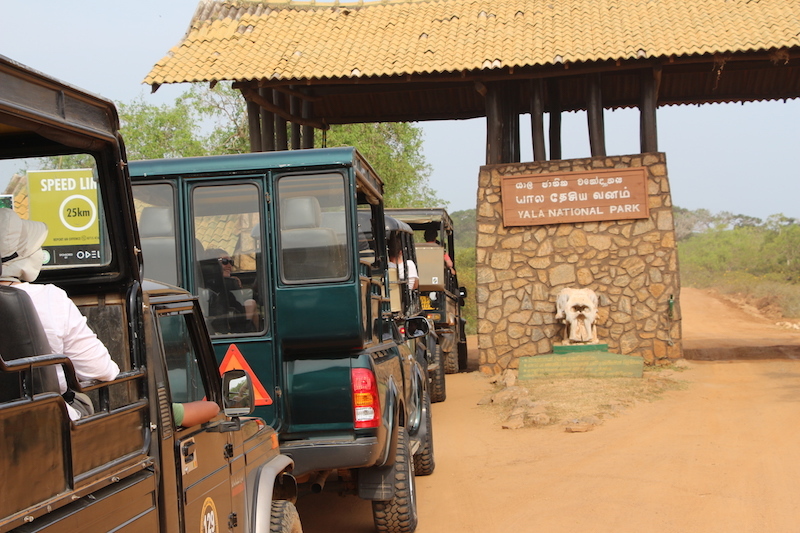 Our final destination this day is Yala National Park, Sri Lanka’s most famous and second largest protected area. We will enjoy lunch outside the park before boarding open-air safari jeeps for our first game drive starting at 2:00 pm. 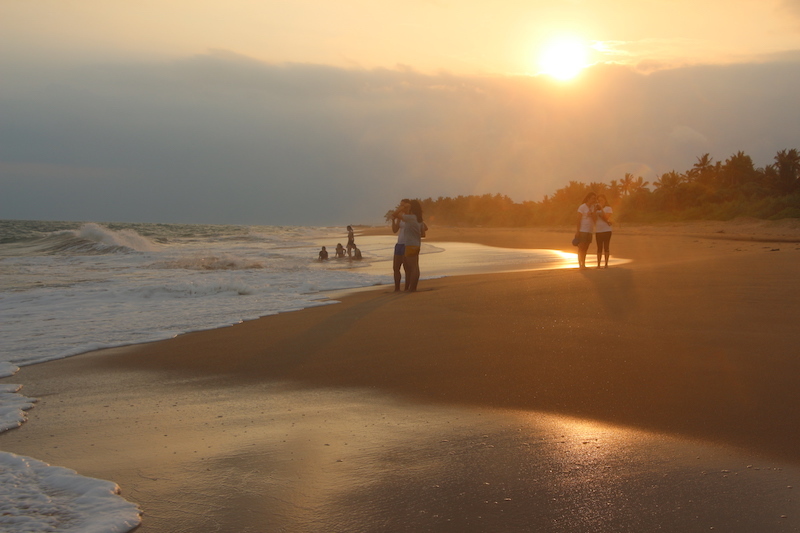 Bordering the Indian Ocean, Yala is a spectacular 350 sq. km. national park that offers the best game- viewing park outside of Africa. Asian elephants are found at Yala in large and small herds as well as sambar deer, spotted deer, wild water buffalo, wild boar, sloth bear, jackals, monkey, langurs, mongoose, monitors, crocodiles, pythons, cobras and many species of birds. But Yalas biggest draw is leopards – an incredible 300-350 in total! This park is well recognized as one of the best locations in the world to observe and photograph leopards in the wild. It has been confirmed that Yala National Park has the world’s highest density of these elusive cats — as much as one leopard per square kilometer. Sri Lankan leopards are distinct sub-species from their Indian neighbors, and are the largest leopards in Asia. Though the prevalence of the Sri Lankan leopard population is high here, it still takes a well-trained eye to observe these powerful cats in action, as well as to know when and where to look for one. That’s where our expert park guides come in. Tonight will be one to long remember as we head to our safari bush camp beside a small lake for a delicious barbeque dinner and campfire. While sitting around the fire, students will have a talk on Sri Lankan endemism and biodiversity before we head out by jeep on a night safari in search of nocturnal animals. 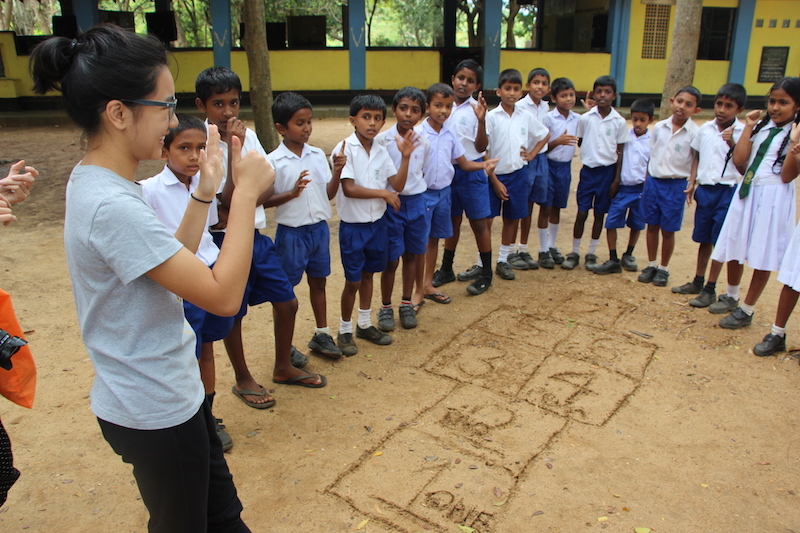 If the night sky is clear students will have a lesson in constellations and a discussion on how Sri Lankan navigators used the heavens to guide them for centuries on trade missions to most of the civilized world. There’s something truly magical about waking in a safari tent at 5:00 am, watching the transition of sound and light from darkness to dawn. After a light breakfast snack we head out by safari jeep once again in search of the elusive leopard. This is one of the best times of day to catch a glimpse of these big cats feeding on night kills. There’s a lot more wildlife viewing in store today, so we break camp after a good breakfast and drive to a nearby wetland. It’s only a 40-minute drive from our lodge to Bundala Bird Sanctuary, Sri Lanka’s first recognized Ramsar Site (i.e. a wetland of global significance). Popular with both resident and migratory birds, Bundala supports 167 species and is the country’s last refuge of the Greater flamingo that congregates here in the thousands in Nov.-Dec. The Bundala Lagoon offers refuge to an estimated 20,000 winter migrants and students will have lessons in how birds follow migration routes. Bundala also provides critical habitat for pelicans, peafowl, adjunct storks, painted storks, purple swamp hens, red waddled lapwings, yellow waddled lapwings, black winged stilts, cormorants, Indian darters, kites, hawk eagles and many non-avian species like black-napped hares, mugger crocodiles and wild buffalo. 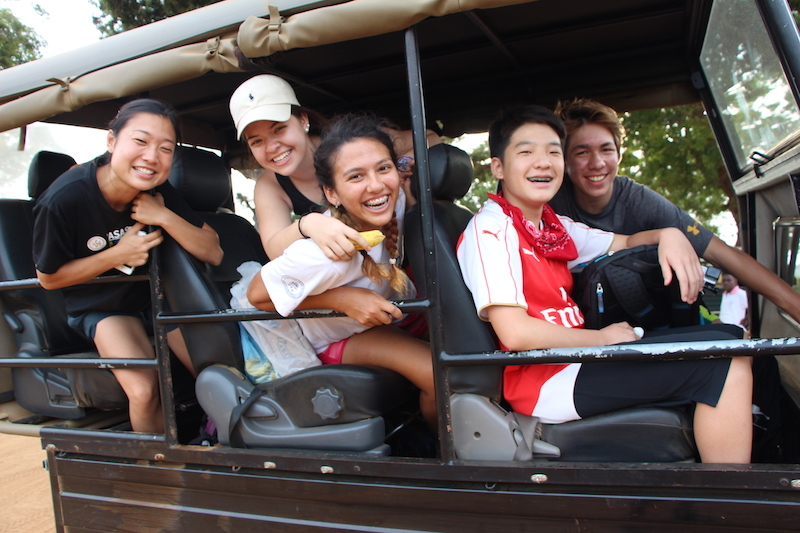 Students will have species lists to identify with the aid of expert birders that will accompany us on the safari jeeps. At the end of the birding trip, student groups will compare their findings. Departing Bundala near noon, we now drive (2-hours) to Udawalawe National Park, stopping along the way for lunch. Udawalawe is Sri Lanka’s second most popular park after Yala and is very famous for large numbers of elephants feeding in the grassy scrublands, even at mid-day. Our final jeep safari will put students incredibly close to wild elephants, allowing them to study intricate feeding and social behaviors. 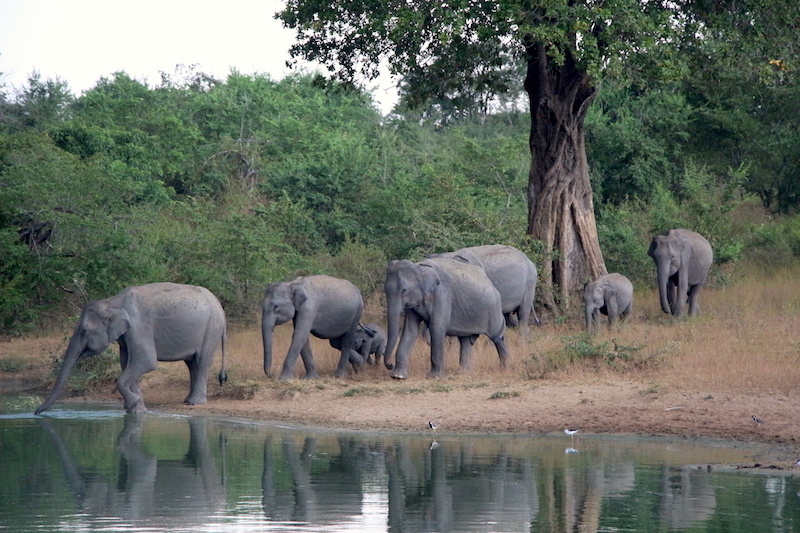 In addition to elephants, 38 other species of mammals and 183 bird species are found at Udawalawe. We are likely to see: sambar deer, spotted deer, muntjac, wild boar, wild water buffalo, toque macaque, langurs, jackal, mongoose, black-napped hare, hornbills and quite possibly – leopards! After a long day of wildlife viewing, we depart the park proper and check into Udawalawe Safari Hotel for a great dinner and the creature comforts students are used more to. After a leisurely breakfast we set off on a 2.5-hour drive to Sinharaja Rain Forest, Sri Lanka’s largest, most beautiful and diverse forest. Out of a total of 830 indigenous flowering plants found in Sri Lanka, Sinharaja supports 500 of them. It also shelters 17 of the islands 21 endemic bird species. Sinharaja has been declared a UNESCO World Heritage Site and students are sure to be enchanted hiking trails that lead to a series of waterfalls while discovering amazing plants and animals along the way. At mid day we stop for a picnic lunch and then visit a small village elementary school where international students will engage in a service project. When the school closes for the day at 2:30 pm, we will depart by mini van for the coast and the beautiful surfing beach of Mirissa. On arrival students can enjoy the remainder of the day frolicking in the surf on a golden sand beach or enjoying the resorts large seaside swimming pool. After a delicious seafood dinner, we will gather on the beach to share tales of our day’s adventures. 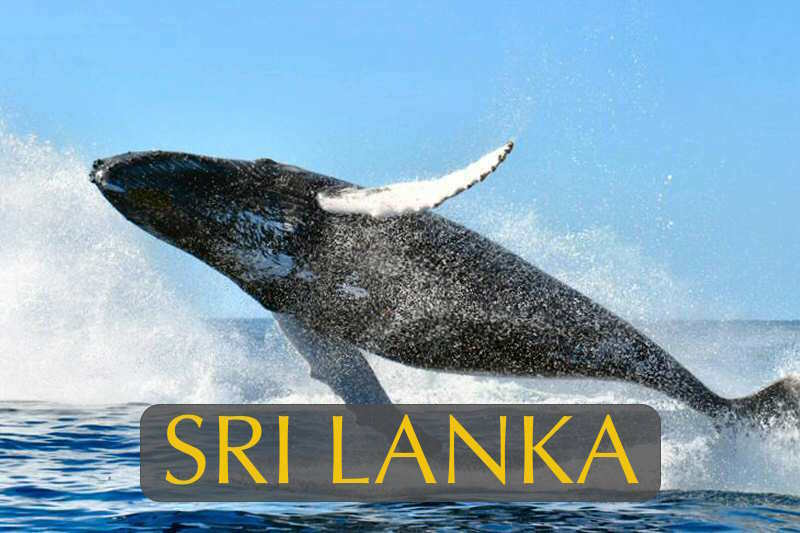 Today may be one of the most exciting days of the trip as we enjoy an early breakfast and head to Mirissa pier to board a charter boat in search of the largest animal on earth – the blue whale. Marine biologists believe that the baleen whales that frequent Sri Lanka waters are exploiting plankton blooms created by the natural flow of nutrients to the ocean from the islands river systems. Whatever the case, the deep drop offs just offshore make Sri Lanka one of the best places in the world to spot blue whales, sperm whales, fin whales humpback whales and orcas. In the best whale-watching months of December, January and April there is a 95% chance of seeing sperm whales and great chances of sighting blue whales – the world’s largest animal, as their migration path is just off Dondra Point. There is something very humbling about having a mammal surface beside the boat that can be 100 meters in length, weighing 180 metric tons and being powered by a heart the size of a small car. Even if whales elude us this morning, we’re almost certain to encounter spinner dolphins and four other species of porpoise and dolphins that frequent these waters. 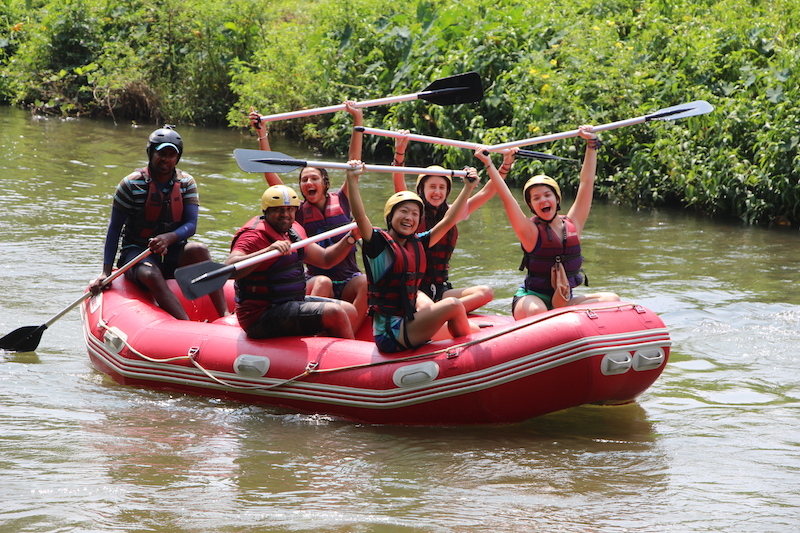 Returning back ashore in time for lunch, students can enjoy the mid-day hours swimming on the beach, at the pool or having a surfing lesson before we check out of our rooms and drive the short distance to Galle Fort further up the coast. Galle is an ancient Sri Lankan settlement; it is believed to be “Tarshish” referred to in the Bible. Today, Galle Fort stands apart as one of the best-preserved examples of 17th century colonial fortifications in the world. The Fort sits on a promontory that juts southwards into the Indian Ocean from the town of Galle, on the southern coast of Sri Lanka. Ramparts encircle a self-contained neighborhood within the fort. The Portuguese started Galle Fort in 1588; but it was under the Dutch, whose army captured Galle in 1640, that the fort owes its present shape. The Dutch continued to work on this fort right up to the beginning of the 18th century when the British took control of the island. Galle Fort is the largest intact Dutch fort in Asia; it was inscribed as a UNESCO World Heritage Site in 1988. The fort was built so strong that it withstood the 2004 tsunami that left Galle town utterly devastated. European colonial history will come to life for students as they explore the ramparts and interior lanes where Portuguese, Dutch and British architectural influences are evident. We will spend the night in the historic quarter to take in the magic of sunset, the enchanting night illumination of the town and the serenity of sunrise. Many shops here will provide students with opportunities to purchase souvenirs and crafts from all parts of Sri Lanka. Students can enjoy a relaxing morning before transferring by mini vans a short distance to the coral gardens of Hikkaduwa Marine National Park for a study in coral reef ecology. Hikkaduwa is considered the best snorkeling site in the south of Sri Lanka and we will have several hours here to explore the rich reefs either swimming or from a glass bottom support boat. We will have lunch in a local restaurant before driving further north to a family run sea turtle conservation center that has been working for generations to protect Sri Lanka’s sea turtle population. On Dec. 26th 2004 nearly the entire family was killed when the Indian Ocean tsunami devastated the site. Two surviving brothers in Colombo on that tragic day have since taken up the cause; they rebuilt and operate the center that releases many thousands of baby turtles every year. Students on this trip will engage in a service project here, helping to clean turtle tanks and creating educational murals on the walls of the complex. Students can also help to build nests for turtle eggs arriving that day from the beach where villagers collect them to prevent being dug up and eaten by feral dogs and people willing to break the law. Five of the world’s eight species of sea turtles regularly visit the sandy beaches of Sri Lanka to nest: green, hawksbill, olive ridley, loggerhead and the massive, but most endangered, leatherback turtles. Students will learn how these species are under global threats from getting entangled in fishing nets and drowning, losing limbs to outboard motor props, mistaking plastic bags and balloons for jellyfish prey and having their nesting beaches taken over by developments including beach resorts. Following our sea turtle service project we have a 1.5-hour drive north to Colombo on the islands new expressway. Checking in to a boutique hotel, just minutes from the airport, students will have an opportunity to clean up prior to a special dinner and a closing candlelight ceremony where each student can share highlights of their journey together. In Touch With Nature Education, Inc.
is a Canadian incorporated company offering educational immersion tours that help people of all ages develop a deeper understanding of how we can be stewards of humanity and earth. Contact us for more information about how we can make your next group trip become exceptional! We offer customised itineraries to help fit your individual needs and interests.